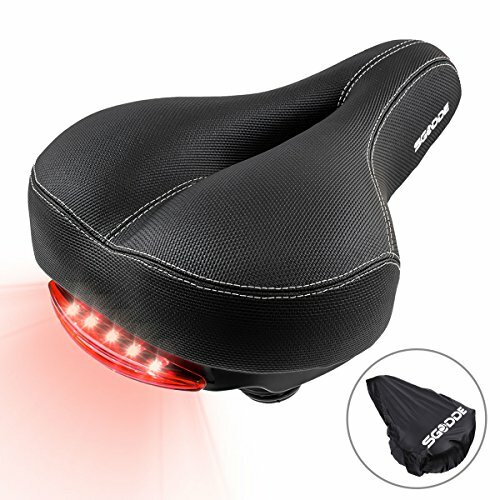 SGODDE BICYCLE ACCESSORIES :SGODDE commited to design comfortable bike seat to our customers.Carbon Steel Metal Frame, Artificial PU Leather with Extra Padded Comfort Bicycle Saddle meets your all needs. UNIVERSAL DESIGN & OPTIMAL REPLACEMENT :This Bike Saddle is made from premium material,It's upgrated design fit for Any Standard Bike, Perfect bicycle saddle replacement for mountain bike, bmx bikes, road bike, kids bike, mini bike, electric bike, stationary bike. BRIGHT WATERPROOF LED TAILLIGHT :There is a built-in red warning light on the bike rear,it will make your safe when riding in raining or dark. The taillight has 5 pcs LED super bright beads and 3 different modes, and convenient for you to switch modes during riding. ERGONOMIC, DUAL SPRING & HOLLOW BREATHABLE DESIGN :Enjoy healthy & happy long-distance riding! Our bike seat front sides narrow design allows thighs moving freely in riding, won't rub thigh. Dual spring rubber ball suspension in the bottom of bicycle seat, more stable, strong shock absorption effect, better protection. Plus hollow design, enhanced breathability. Absolutely worth buying. TOUGH AND DURABLE: Anti-scratch and wear-resistant PVC will outlast years of wear and tear. We've also included a waterproof cover for added protection! You'll be using this bike seat for years to come. If you have any questions about this product by SGODDE, contact us by completing and submitting the form below. If you are looking for a specif part number, please include it with your message.